Recently, Ryan and I were on a weekend vacation just the two of us. It was awesome! Besides the fact that I am a travel junkie, I really think it is important to take time away from other distractions and focus on your spouse! My Oma has always told me I should put my spouse first (after God of course) above everything else. As he is to be my partner in all things in life. Life can be very difficult if we aren't on the same page. 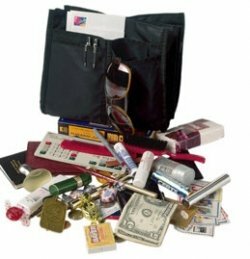 What is in your purse that shows you are a mom? No bandaids in my purse - horrible mom? I keep diapers, wipes & snacks. Those snacks are all important and I often forget those! !